Po and Viper's Staring Contest. Credit goes to it's original creator!. HD Wallpaper and background images in the kung fu panda club tagged: kung fu panda po viper. Credit goes to it's original creator! 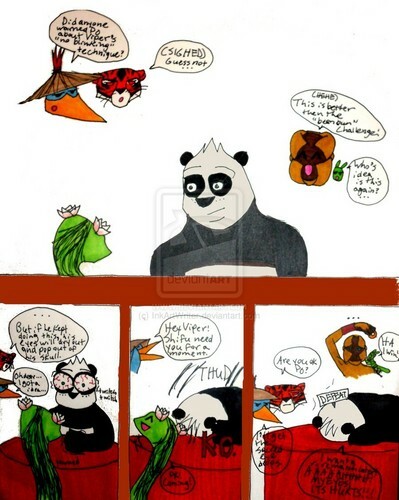 This kung fu panda fan art contains animado, cómic, manga, historieta, anime, and dibujos animados. If you click on the picture you'll get an enlarged version of this pic, and I didn't draw this, If I did you'd really have a hard time reading it! Oh really?Then how come it says submitted by Tigressfan 10689? That means I yuploaded it. Credit goes to the original artist.